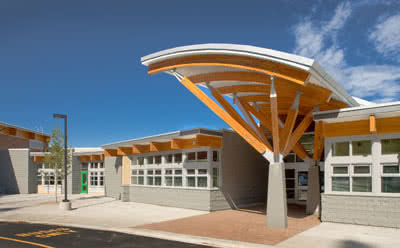 The project is comprised of a 33,000 square foot glue laminated timber frame elementary school, sports field, parking area, playground and landscaping on a 4 hectare site; North Saanich, BC. Construction commenced in the spring of 2007 was completed in August 2008. The school was designed following sustainable environmental and land development principles, and incorporates several innovative low impact design features. Total project value $12,965,000.